In 2018, Brussels Airport welcomed 25.7 million passengers, an all-time record that is largely driven by the expansion of the intercontinental network. Air cargo closed the year with 732,000 tonnes carried, which is the highest freight volume in 10 years. Over the 60 years of its existence, Brussels Airport has welcomed no less than 610 million passengers, all categories combined. Last year, Brussels Airport welcomed 25,675,939 passengers, i.e. a 3.6% increase compared against 2017. This growth is chiefly seen in the number of originating passengers which went up by 4.3%. Standing at 18%, the share of transfer passengers has remained relatively stable compared against last year. This handsome growth is largely explained by the 18% rise seen in the long-haul flight segment. Nearly two new travellers out of every three flew long distance in 2018. Brussels Airport’s intercontinental network expanded even further in 2018 with new routes launched by Cathay Pacific to Hong Kong en by Hainan Airlines to Shanghai and Shenzhen. Other new routes now also include flights to Dubai organised by Emirates, to Bangkok by Thai Airways, whereas Ethiopian Airways has stepped up its seat capacity to Addis Abeba. The short-haul flights also proved a distinct success in 2018. The resumption of leisure flights to Turkey, Tunisia and Egypt also explains the rise in the number of passengers compared against previous years. As it is, the month of July recorded a resounding performance with 2.6 million passengers. 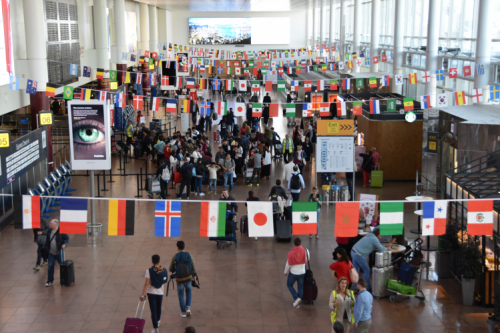 One date in particular that stands out in this respect was Friday 20 July, when Brussels Airport welcomed no less 94,928 passengers in a single day. In 2018, Brussels Airport also carried 731,613 tonnes in cargo, representing a 5.8% increase up from 2017. Belly cargo enjoyed a very substantial +14.1% rise, thanks to the new destinations. Full cargo volumes and express service volumes recorded a loss of 5 and 1.7% respectively. The highest increase was seen in trucked cargo, which went up by +20.9%. In the flown cargo segment, imports went up by 7%, whilst exports remained stable. For trucked air cargo, we saw a very substantial increase of 47% in imports, whereas exports fell by 6%. Also worth noting is the significant rise in the export volumes of pharmaceutical products: plus 32% over the year as a whole. In 2018, the number of flight movements showed a slight1% decrease on 2017. The average number of passengers per flight went up by 5.8%, rising from 120 in 2017 to 127 in 2018, thanks to larger aircraft.